ARM is famous for its extremely low power core processors that have been widely used in smart phone market since long time ago. While ARM is trying to come out with more powerful Cortex processors to tap in netbook market that is currently being monopolized by X86 based processors such as Intel Atom or VIA Nano processors, at the same time it also focuses on how to further reduce the power and foot print to stay competitively in mobile market. Just recently, it has unveiled a next generation of core processor, named as Cortex-M0 that is claimed to be the most power efficient and ultra small form factor targeted for SoC (System on Chip) applications. 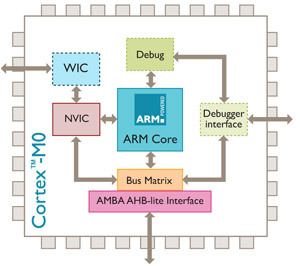 ARM Cortex-M0 is a 32-bit processor that featured with some complex ARM 180ULL cell library for faster processing capability. With power consumption of as little as 0.085mW, it can be fitted well in various SoC applications such as gaming accessories, portable medical devices and ZigBee wireless network devices. It is believed that NXP and Triad Semiconductor (ARM licensees) will be some of the earliest customers that could have started the design with Cortex M0 but more licensees such as Samsung, Apple are expected to join the development effort soon to come out with competitive products in consumer market.